The long awaited metamorphosis of Shadow Fiend arrives at last. In addition to a completely new look for his form and effects, the update also contains the Demon Eater Arcana. This Arcana provides a fiery reimagining of Shadow Fiend, complete with new effects, sounds, animations, icons, and an altered voice. We also thought it’d be fun to allow you to show off your skill at triple-razing enemies to the ground, so with the Arcana equipped you’ll be see a fiery celebration of your skill. Finally, if you buy the Demon Eater set before October 31st, it will come with an ‘Exalted’ quality. Yet Shadow Fiend isn’t the only one receiving special treatment – this update also contains the much-anticipated 6.82 balance update, which introduces an arsenal of additions and tweaks affecting every part of the game. Major systems have been overhauled, and heroes have been retooled and reworked. Bloodseeker and Phantom Lancer both now sport new abilities, you’ll find a new rune in the river, a new item in the shop – the list goes on and on. And for the first time in years, the Dota 2 map itself has changed, with significant layout changes to Roshan’s lair, base fountains, and more. What are you waiting for? 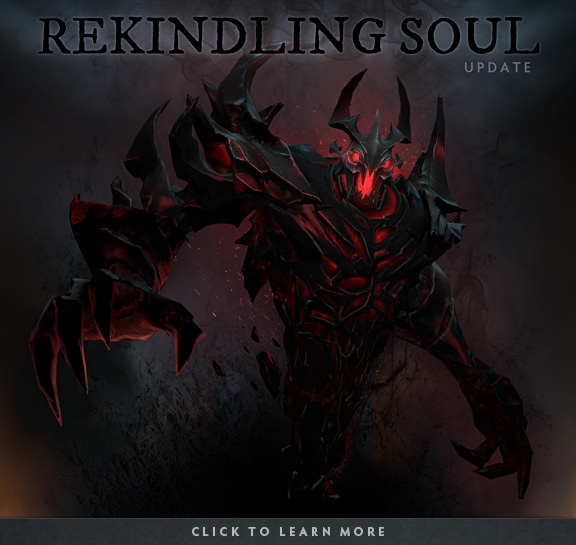 Head over to The Rekindling Soul Update Page. If you’ve never watched Dota 2 played live, you’re missing out. The sword swings, the ancient explodes, and the crowd roars. It’s amazing, but don’t take our word for it. There are two upcoming events for you to check out: if you’re near New York City, check out ESL One in Madison Square Garden on October 9th and 10th. Or, if you’ll be in Yinchuan, China next month, the World Cyber Arena will be holding their LAN finals at the Yinchuan International Convention Centre from October 2nd through the 5th. One more thing: we on the Dota 2 team have a number of updates in the works right now that we’re really excited about, some for the rest of this year, and a big update for early next year. But we’re pretty sure we won’t be able to make enough progress on the larger update if we put it down to work on Diretide – so we’ve decided that we’re not going to ship a Diretide event this year. We know that last year we weren’t clear enough in our communication about this, so this year we wanted to be up front about it early. Next year will bring monumental changes to Dota 2, and we’re confident that when you’ve seen what we’ve been working on, you’ll agree it was worth it.